It can be challenging to achieve and maintain a healthy lifestyle in the busy life of a hairdresser. Eat well, exercise often, take time to relax. Getting these advice can be stressful on its own. 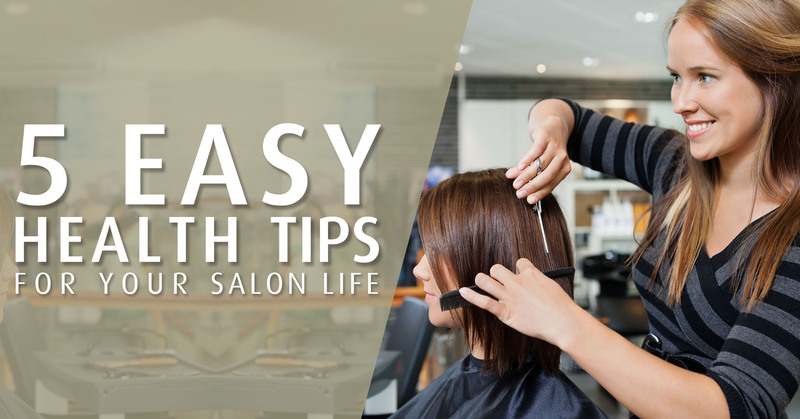 We have gathered 5 easy and healthy habits for you to incorporate in your everyday salon life. Pick those that fit into your personal rhythm, or challenge your salon team to motivate each other. This exercise only takes 1 minute! During a busy day, it is easy to forget to stop up and breathe. When you stop for a while to take a deep breath, you allow yourself to feel the condition of your body and how you are feeling this moment. Being aware of your body helps you to fight stress. You can do it while you are visiting the ladies room, or make it a habit every time you take a break. Roll your shoulders down and away from your ears. Take a deep breath through your nose and fill your lungs with air. Allow yourself to pay attention to how you are feeling. Drink water instead of coffee. Drinking water improves your overall health, it helps detox your body and keep your fluid balance in order. And not least, it works wonders for your hair, skin, and nails too. To remind yourself to drink more water, keep a bottle at your station or put up a poster near your sink saying “Drink a glass of water”. Maybe make a common goal in your salon team of how much water you should drink during the day. And hold each other to it. Hide candy and sweet snacks in the cupboards (or even better: throw it away) and put out healthy snacks like fruit, carrots, or nuts instead. When it is right there in front of you, you tend to eat more of it. A great tip is to meal-prep your snacks. Every Sunday night, make 3-4 bags of cut out fruit and vegetables ready to bring the following mornings. Stand with your back against a wall with your legs a little bit more than shoulder-width apart. Bend forward and try to touch your right foot with both hands. Hold for 30 seconds. Getting enough exercise is a huge concern for a lot of people, and it is for sure one of the top sources to a healthier life. But this doesn’t absolutely mean that you should suddenly start working out at the gym 5 times a week. Integrating exercise into your daily life can be challenging with a busy schedule. Do it at your own pace, and remember to have fun while doing it. Whether you are used to being active or not, going for a walk during your lunch break is an amazing habit to integrate. As a hairdresser, you mostly spend your working hours indoor, and this way you get your daily fresh air, exercise, and renewed energy for the rest of the day.